Garlic is touted as both a delicious ingredient good for almost all savory cooking and a potent natural medicine. Honey, too, is both a sweet treat and a powerful antibiotic. Here is an incredibly easy recipe in which their forces are combined to make a savory lightly fermented infusion. The syrup can be taken to maintain health or at the first sign of illness. This can be a vital asset in your survival medicine kit! Fill a clean glass jar three-quarters full of peeled garlic cloves. They can be whole, chopped, or smashed. Whole cloves will give a slightly milder garlic flavor. Chopped or smashed will give an intense burst of garlicky goodness. 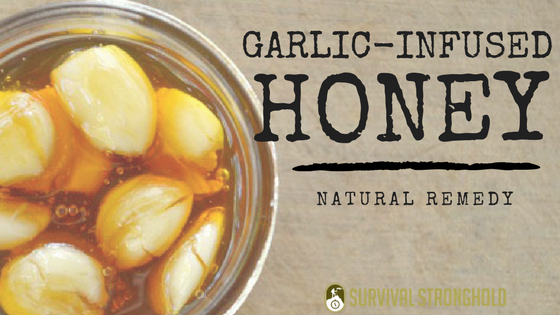 Cover the garlic cloves with your choice of honey, preferably raw. Use a chopstick or butter knife to gently stir the garlic cloves, allowing air bubbles to escape. Add more honey to fill the jar if needed. Cover the jar with the lid, but don’t close it too tightly. The fermentation process will create gas that needs to escape so your jar doesn’t explode! 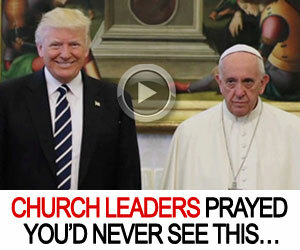 You should see bubbles appearing after a few days! Set the jar aside in a warm place in your kitchen. Open the lid every few days to let the gas out. Every couple of days, close the lid tightly and turn the jar upside down to mix up the honey and garlic. You can let the honey infuse for as long as you like. The longer it sits, the more pungent it will become. A month is a good amount of time to get just the right balance of garlic flavor. Once done, you can either store the honey with the cloves still in the jar or strain the cloves out to cook with! Either way, store the finished honey in the fridge and make sure it is clearly labeled! A splash of this savory syrup is great for camp cooking, especially open-flame grilled meat! Just transfer it to a lightweight bottle to keep with your camping gear. When cold and flu season is in full swing, you’ll be at the top of your game thanks to the antibiotic and antiviral nature of garlic and the moisturizing honey. Take a spoonful of the soothing syrup for coughs and sore throats or as a general health tonic.